To me, China has always been the epitome of the Far East: fascinating and mysterious. “China is very different, don’t have any illusions,” said my old friend Diddi shortly before my departure, “it is more modern than you can imagine. And above all, you’ll never find yourself alone there.” Now I was on the plane – and even what I saw from up here was impressive. Industrial buildings that resembled military barracks covered areas as large as some small European countries, with residential tower blocks reaching high into the sky. Merchant ships sailed like a swarm of herring along the shores of the Yellow Sea and, dipped in a saffron haze, lay Shanghai, this ancient city that looked incredibly modern, young and dynamic to me. 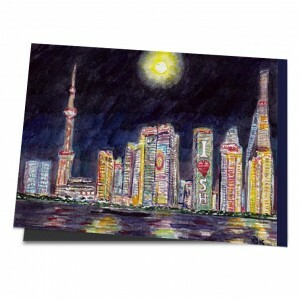 The next evening I was painting on the waterfront promenade ‘The Bund,’ which was flooded with people strolling along it; in front of me was the Huangpu, flowing swiftly, on the other shore there were the glittering skyscrapers of Pudang, which rank among the most beautiful in the world and had become my motif. The time passed quickly, and the stream of people diluted more and more. All at once – plink, plonk – the lights of all skyscrapers went out at the same time. I glanced up in surprise, looked around and saw: I was totally alone. Everything seemed so quiet all at once. Even the noise of the city seemed silenced. The full moon was glittering in the Huangpu, stars shining in the clear, black sky. It was a moment to pause, almost magical. And suddenly Sun Wukong, the legendary Monkey King, was standing there next to me. Small, dainty and all in gold. His black eyes sparkled, he was curious, wanted to see what I was doing. I showed him my picture, pointing to the dark silhouettes of the skyscrapers. He looked at it for a long time and gave me a friendly nod, before turning to leave. If his golden spear had suddenly lengthened, if he had crossed the Huangpu with a triple somersault, or if he had drifted away on his cloud – none of it would have amazed me at that moment. I watched him for a long time, almost expectant, but the little man in the fancy monkey costume looked tired, as he was slowly lost in the distance after a long day at work and eventually disappeared into the large troop of street sweepers, who now approached noisily. I quickly finished my picture, packed my painting things and escaped just before the busy sweeping brooms. At the roadside I waved a taxi from the traffic flow, showed the driver the business card of the hostel and then we rushed along streets that meandered through the skyscraper ravines, through night time Shanghai.